During my time as a Royal Air Force photographer in the 1960s, 35mm cameras were regarded as a dangerous innovation and colour photography a dark and unnecessary art. 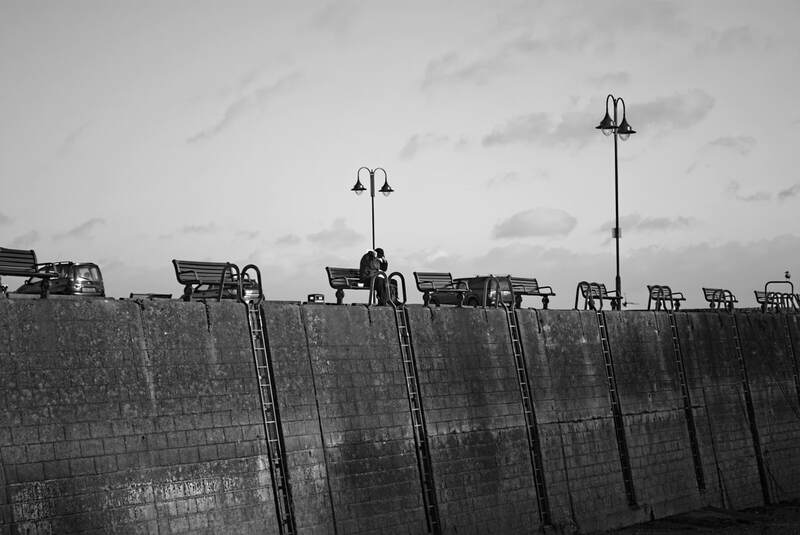 So that I developed a lasting affection for monochrome, and for its ability to create stark ambient images or render fine detail without chromatic distraction. Newgale Reflections. Newgale Beach and Rickets Head in low winter sun. Wide angle and a bit of an homage to Ansel Adams' s "Zone System". There may also have been a filter involved - I couldn't possibly comment. Click on the image for purchase options. Between the Storms. One for the history books! 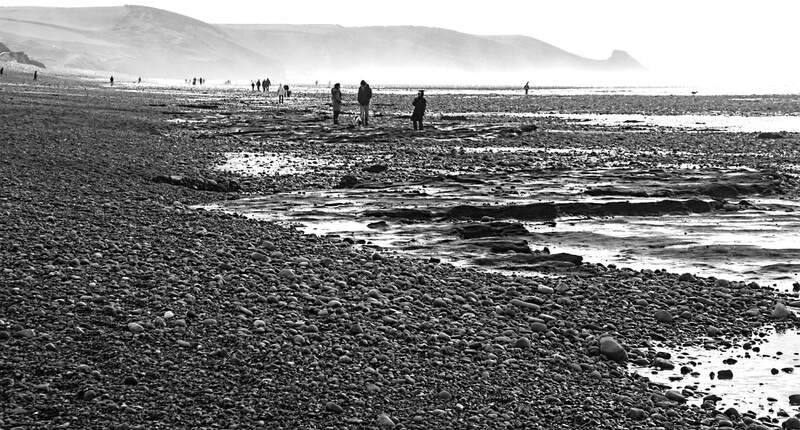 A single day's respite from the storms of winter 2013/14 brought the locals out in force onto a Newgale beach stripped down to peat beds and shingle. Click on the image for purchase options. St Davids Head from Pwllderi. From above Pwllderi the whole range of the coast as far as St Davids Head is visible. Pwllderi is also one of the most spectacular YHA settings in the British Isles. Strumble Head Light. The lighthouse at Strumble Head sits just off the spectacular headland overlooking a wild tidal race. The Wales Coast Path passes close by. Penrhyn Erw-goch. On the Wales Coast Path between Cwm yr Eglwys and Fishguard, reached by a steep ascent from sea level. Fishguard Bay from East. A less travelled section of the Path, ascending steeply from Cwm yr Eglwys to cross a spectacular series of cliffs, headlands and bays. The approach to the lighthouse at St Ann's Head. The headland encloses Mill Bay to the north and east. This was Henry Tudor's landing place, on 7 August 1485. Click on the image for purchase options. Rock of Ages. 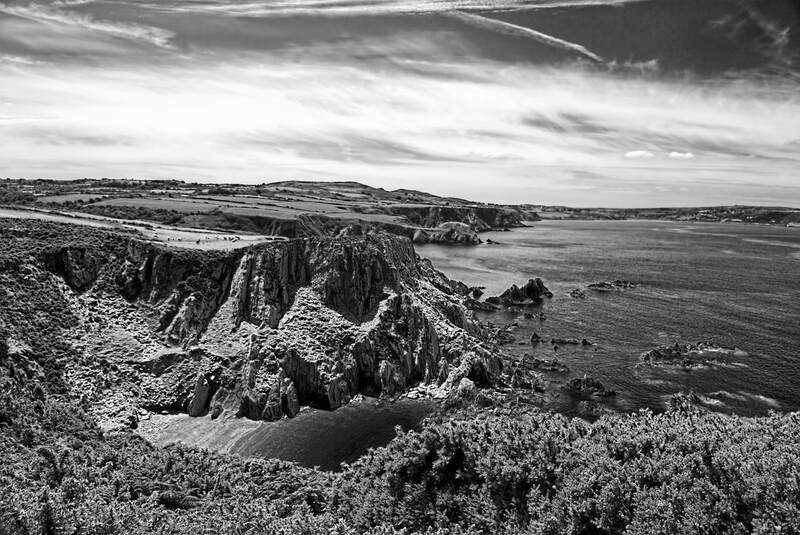 Pembrokeshire has a greater variety of geology of any region of comparable size in the UK. 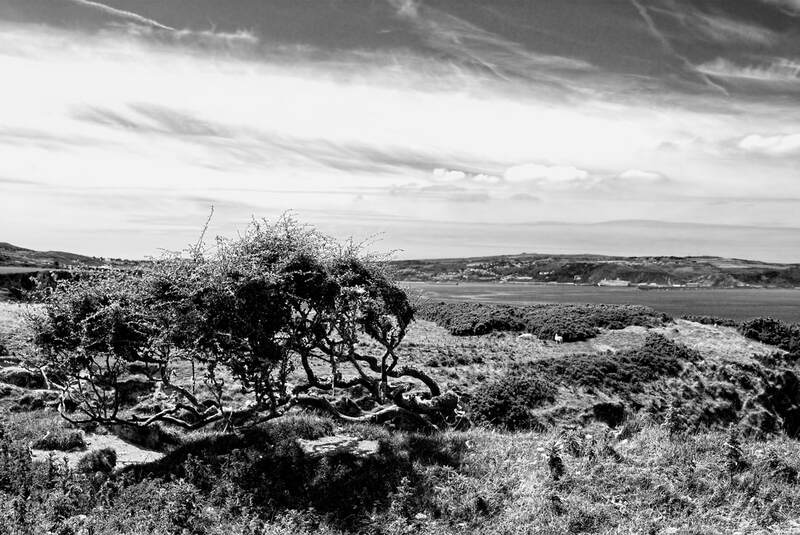 Image capture from the Wales Coast Path to the east of Porthclais on the St Davids Peninsula. Click on the image for purchase options. Once there were whalers! 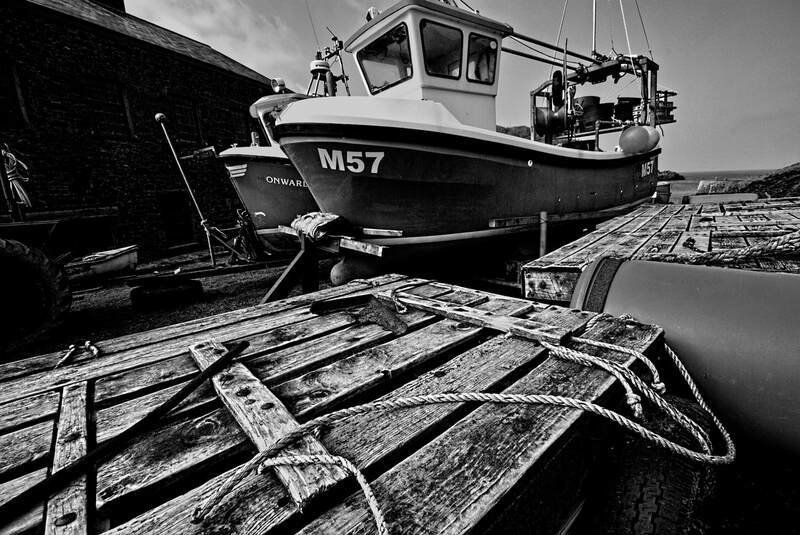 At the landing dock in Milford Haven. Click on the image for purchase options. There's a time to surf and a time to wax your board. The remains of the day at Newgale. Click on the image for purchase options. 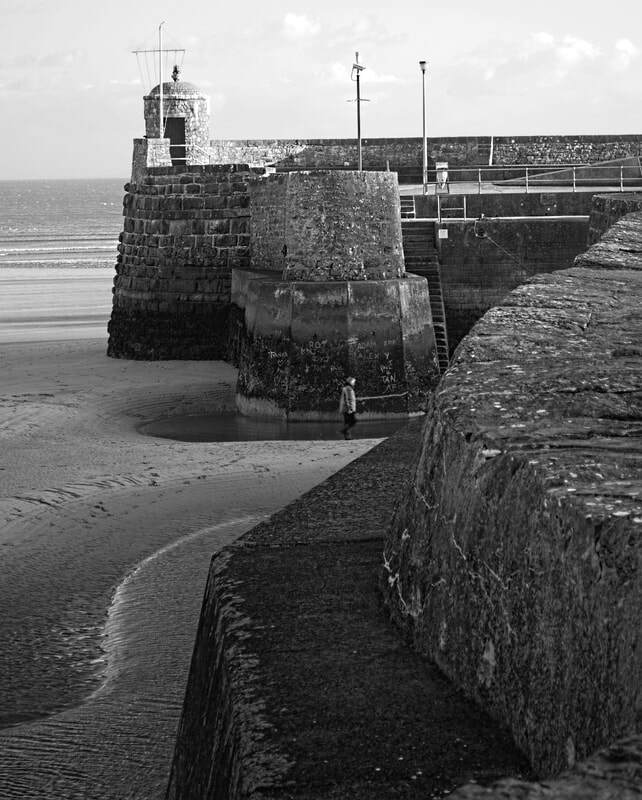 Saundersfoot Harbour at low tide. Sweeping lines of stonework and tidal pools. Click on the image for purchase options. The Beach at Cwm yr Eglwys. Site of the storm-wracked remnants of St Brynach's Church at the sea's edge, victim of the Royal Charter Storm of 1859. This catastrophic event saw some 220 ships lost or damaged at a cost of more than 800 lives. Click on the image for purchase options. Marloes Reflections. Rock outcrops and rock pool reflections on Marloes beach. Click on the image for purchase options. Pwllderi Youth Hostel. A bit of an arty conversion of the colour image on the Coast page. Soft clouds, crisper outcrops. A strong display image in the right setting. Click on the image for purchase options. The Parrog, Newport. A full 360 panorama of the Parrog, from the foreshore at low tide. A slightly eccentric creative treatment, shot directly into the sun with lens flare and burnt out highlights retained. Love it or hate it! Click on the image for purchase options.